SATURDAY / Sun salutations: For a zen start to the weekend, New Orleans Museum of Art hosts yoga in the sculpture garden every Saturday morning at 8 a.m.. 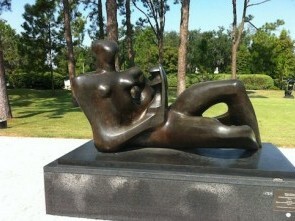 The sculpture garden is nestled in the heart of City Park. Do your downward dog among the art and oaks. With fresh air and lush surroundings, your practice will surely put the Om in NOMA. This Saturday, all that peaceful feeling will come in handy when you return to the Sculpture Garden with the little ones for the noon to 2 p.m. Easter Egg Hunt. And that’s a totally different kind of energy. SATURDAY / Brooklyn boys with the Brooklyn noise: Hipsters are born at the intersection of microbrews and farmers markets. This Saturday, though, everyone can enjoy the beautiful weather at the Crescent City Farmers Market Saturday morning from 8 a.m. to noon at 700 Magazine Street, corner of Girod. The Brooklyn Brewery House Chef will be talking local ingredients and beer pairings. Stop by for a sample of some Nola grown food and Brooklyn brewed beer. SATURDAY / Glory, glory: St. Patty’s day has Irish Catholics covered this weekend, but what about everyone else? The Healing Center is presenting the Second Annual New Orleans Sacred Music Festival. With the theme of Spirit Grooves, they are celebrating music’s ability to transcend boundaries and connect people with a diverse group of cultures and religions, from Tibetan monks to Gospel singers. The songfest unfolds from 11 a.m. to 10:30 p.m. at the Tnew Orleans Healing Center. Tickets start at $15 (an online special) here. SATURDAY / Outside the law: Notorious New Orleans Lady Arm Wrestlers are back at One Eyed Jacks at 8 p.m. Saturday (with a cocktail mixed half an hour before to meet rad groups) with their Matron Saints Brawl. These heart-breaking and arm-breaking ladies will be going hand to hand this weekend to support of Reach-In C.A.R.E. Local community organizers will be there to meet and greet. Like all good fights, it will be followed by a dance party. Anna Shults is associate editor of NolaVie.